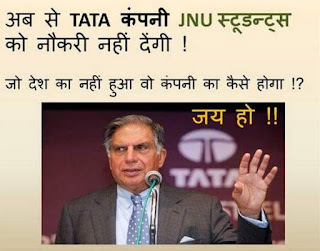 Life & Beyond : THE RATAN TATA JNU BUZZ? Yesterday, during and in the context of one of my articles on the ongoing Jawaharlal Nehru University (JNU) row, I had used 'access chaos and information chaos' - that how access can become excess when we lead to chaos - and we are misled to chaos. And apart from the developments directly related to the JNU controversy, something happened that became its most legitimate example of the day. It was the Ratan Tata development. Now Ratan Tata is probably the most respected figure of the corporate India and that too in a constellation of very few. And the most remarkable thing about him is that his popularity extends beyond the corporate realms. He is a real brand custodian of the most trusted and sincere brand name in India's industrial space - Tata - that percolates much deeper in our psyche. Tata stands out not only for its corporate social responsibility but goes much beyond with its many 'for society' initiatives like hospitals and research institutes. The name Ratan Tata inspires us to aspire - with his integrity, with his simplicity and with sincerity. 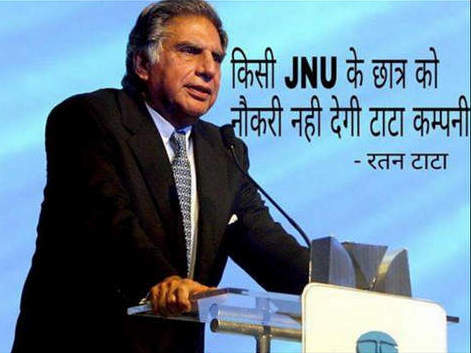 That Ratan Tata was at the centre of a rumour mongering social media frenzy last day that linked him to the ongoing JNU row - in fact shown him taking sides - showing him in solidarity with the so-called 'anti-national' elements of JNU. And it went to the extent that Tata Sons had to issue clarification that Ratan Tata had not said so. Here is the message that went viral that said that 'Tata would not employ JNU students anymore'. 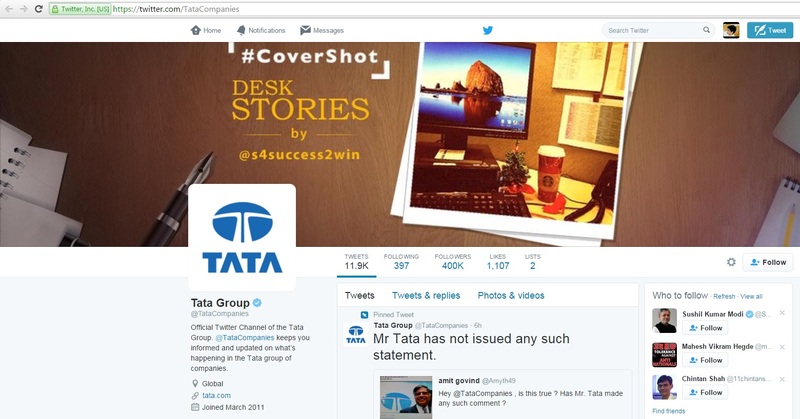 These images in fact look so shabbily treated and those who really know about Ratan Tata would not believe them. But then there are many in this country, like those who are busy presenting their nationalist credentials these days, sometimes in JNU, sometimes in Hyderabad, sometimes at the Patiala House Courts complex, would grab such 'adding fuel to the fire' developments instantly - like tens of thousands of shares and likes on various social media platforms and on services like Whatsapp. The charade went on for so long and spread so wide that the Tata Group had to take notice and issue clarification that Ratan Tata did not issue any such statement. This is a perfect example how information access becomes chaos in one go and how rumours so quickly spread to add to a raging controversy or social unrest. The information available on internet can cause more harm than good if not used cautiously (and judiciously). The dream to make information accessible is a dream for everyone to see but we need to put qualifiers so as to lead us to order and not to chaos.